On the 4th January, Zara and Daniel tied the knot in a beautiful and unique ballet themed wedding in Southern Australia. 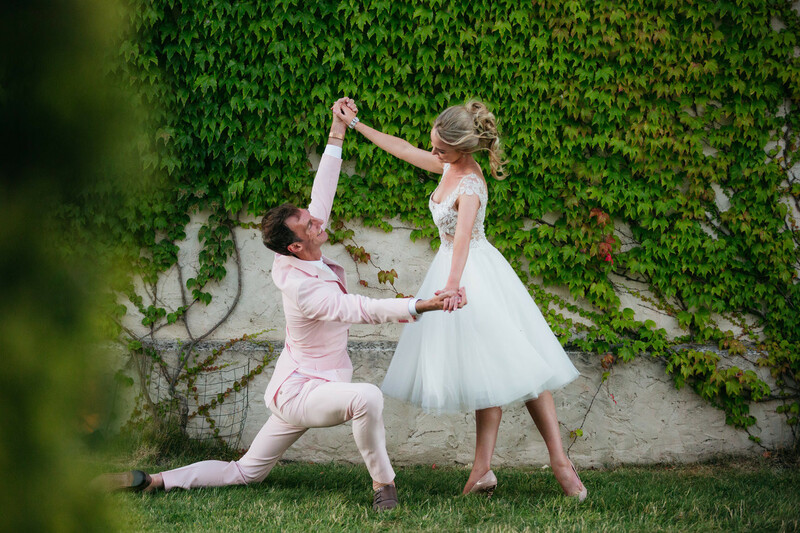 This intimate wedding of 80 guests was themed around the elegance and beauty of ballet dancing with soft ballet pinks and whites making up the majority of colour scheme with some additional deep greens and wood to add depth to the decor. This airy and romantic wedding was fresh and full of beauty. We sat down with the lovely bride, Zara, to hear more about their love story and just how this ballerina and danseur said I do. We met 4 years ago when Daniel came to dance for my Ballet School in Canberra. It was Christmas day and he took me on a very long walk around a beautiful part of Melbourne. When we arrived back at his parent's house, he took me into a quiet room and knelt down on one knee and asked would I marry him. I cried and laughed and jumped into his arms. Mind you, at first, I was just as excited thinking he had adopted a dog for us and that I was going to get it as a present. But a diamond ring from my wonderful man more than made up for the lack of a dog that Christmas day. We love design and we started by choosing our colour pallet which was soft rose pink & rose gold. We went for a rich, warm rustic Italian inspired vibe following a trip to Italy and falling in love with the Tuscan countryside. We chose The Stones purely based on how much it made us feel as if we were back in Italy. My gown was made in Russia by a beautiful designer, Milva, who I found online following my first local dress fitting, after which I felt a tad despondent about how much I'd have to alter all the dresses I tried on in order to even remotely resemble and reflect my taste. When I searched on Pinterest to find more of what I was after, I came across this gorgeous design. It took hours to locate this picture to the designer but finally I managed to track down the website and immediately got in contact with her via email. After seeing her range of very unique and stunning dresses, it was so hard to choose the exact one for me, especially as I wasn't able to try any of them on. But Milva was able to describe each of the dresses I loved and how I would feel in them on the day. She also asked me lots of questions about the setting of the venue so she could picture exactly what I was after. I finally made a decision to purchase a beautiful soft pink gown with a milk lace overlay. The dress felt very elegant to wear and the quality of the fabrics were divine. As I wanted to dance all night, I also decided to get a very pretty and more fun inspired short wedding dress made by the same designer. As for my husband's attire, he has been an Arthur Gallan fan for some time, and he was beside himself when he inadvertently walked up the stairs of a 'local tailor shop' in a little side street in Toorak near the same corner of Arthur's boutique store to then be greeted by Arthur himself. Daniel couldn't say no, hehe, and the rest is now history. He wore a stunning tailor-made pink (that his dad preferred to call salmon) suit designed and made by Arthur himself with fabrics ordered from Russia and Italy to complement the wedding dress. Everything! But a few very special highlights were: Seeing each other for the first time that day as I entered the Chapel, and our first dance as husband and wife! Amidst a lot of smiles we also cried a lot. Elope haha I'm so kidding. But just remember to plan your day never losing sight of why this day exists. That is, to mark the beginning of a life with the person you love the most. Personalized vows make for a very special and emotional moment that you and your guests could never forget given the verity of words coupled with a moment of raw emotions that just cannot be anticipated. We would also love to especially thank Rick Liston, Andrew Redman, Nick and team from Rutherford Entertainment, Victoria Jade, Milva and Arthur Gallan, for going above and beyond in so many ways and bringing our dreams for this wonderful special day to fruition. Given our line of work and the number of hours we commit, we are not often 'out there' kind of people, however, these wonderful people truly made us feel comfortable and worthy of the attention that such a day bestows on you. A great wedding is made up all those who special and who love and support you. And for this we would also like to acknowledge all our family and friends who very presence contributed to such an amazing day and evening. Cake: Miss Lady Bird Cakes, Melbourne.